Courtesy Chevrolet Center will be having our annual Service Clinic on Saturday September 10, 2011 between 8:00am and 4:00pm. During our service clinic we will be performing free vehicle safety inspections for our customers. We want to give your vehicle a thorough check up so you can feel safe and confident in the condition of your car. This will be a visual safety inspection and no repairs will be made to your vehicle. 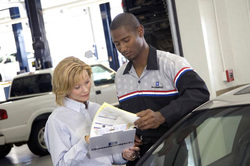 We will be giving you a written report of your vehicles condition at the end of your inspection. This clinic is by appointment only as we would like to give you and your vehicle special time and attention. Please call 619-378-4104 or fill out the contact form below to make your appointment.